Temporary Stalls: The Harbor Department may assign a vessel a stall on a temporary basis, depending on availability. This is called “hot berthing.” Owners of vessels granted temporary assignment must be ready to move if requested by the Harbor Department. Fees: Moorage fees will be assessed by the Harbor Department, based on the rate structure in the City municipal code. Moorage bills must be paid at the Harbor Office. Registration of Transient Vessels: All transient vessels are required to register with the Harbormaster within 8 hours of arrival. Information on services and fees is available at the harbor office. Moorage of Transient Vessels: Transient vessels are advised by Harbor Department staff of the transient moorage areas available on a first-come, first-served basis. Transient Fees: Transient moorage fees are $1.09 per foot per day for vessels 0-80 feet in length. For 81-150 feet, $1.86 per foot per day. For vessels more than 150 feet, $2.80 per foot. All moorage must be paid in advance or prior to departure or fees may be doubled. Harbor policy requires that if a vessel is in the harbor on any portion of any day, it will be charged for moorage for that day. A 25 percent credit in daily transient moorage will be given to any commercial vessel actively loading or unloading fish and which produces a fish ticket or processor contract. The credit will be good for up to 10 days per fish ticket or contract. Transient Services: Water, garbage and waste oil service are available. Launch Ramp Fees: The daily fee is $5.00 for in and $5.00 for out. The annual calendar year permit is $75.00 and is available at the harbor office. 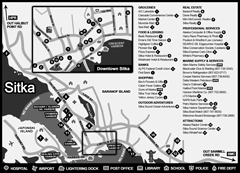 Launch ramps are located at Sealing Cove and Crescent Harbor. Monthly (30 day) Moorage Permits: Thirty (30) day moorage permits are available, paid in advance. The cost is $18.69 per foot for vessels up to 150 feet in length, and $28.02 per foot for vessels above 150 feet. Small Boat Electrical Service: 30 amp single phase service may be available for a fee of $7.00 per day. 50 amp single phase service may be available for $15.00 per day up to 4 days. If staying 5 days or longer the meter can be read, which includes a $10.00 in and $10.00 out fee plus actual meter usage. Meter reads will be done for 50 amp 3 phase and 100 amp meters. Temporary Use of Assigned Meter: The Harbormaster may temporarily allow a transient vessel to plug into an assigned meter. The assigned meter holder’s account receives credit. A note: Utilizing assigned meters is a privilege and the Harbormaster frowns on meter use without permission. Violators will be issued citations for illegal use of a meter. Garbage: Dumpsters are available at all harbors for use by harbor patrons. Items too large for the dumpsters are to be taken to Jarvis Street Transfer Station. Items should not be left on the floats or fingers of any of the harbors. Used Oil: Disposal tanks are provided at all harbors. Please do not dispose of gasoline or solvents in these tanks. These should be taken to the Sawmill Cove Industrial Park scrap yard, where a special materials collection area is maintained. When dumping used oil, please clean debris and old filters off the screen when you are finished. Water: Potable water is provided at all harbors year-round. Dumping Trash Into the Harbors Prohibited: It is unlawful to do or cause to be done any of the following prohibited acts: No offal garbage or trash shall be dumped into the boat harbor. No trash, garbage or refuse shall be dumped on the tidal or upland areas along the beach or waterfront. It is unlawful to dump flammable wastes. Vessel owners shall not leave spoiled bait, fish or gear on their vessels in the harbor. Fishermen’s Work Floats: There are two work floats available. One is the seasonal float located at the end of Float 4 at Crescent Harbor. This float is available for work-related uses April 15-Sept. 15 annually. A year-round work float is located on Sitka Channel across from ANB Harbor. This float is equipped with both electricity and potable water. No overnight moorage without permission of the Harbormaster. No storage of any gear, nets or materials is permitted. All users of these floats are asked to clean up after themselves. Tidal Grid: A steel and timber tidal grid is available for use next to ANB Harbor. Electricity, potable water and garbage services are available. A small parking lot is located next to the grid for people using the facility. The grid is available on a first-come, first- served basis. Vessels are limited to 96 hours (4 days) on the grid. Larger vessels (over 58 gross tons) must notify the Harbormaster before using the grid. In some cases, a damage deposit must be posted and special precautions must be used, as directed by the Harbormaster. Please contact the Harbormaster prior to using the grid if there are questions about your vessel. There is a $10 (ten dollar) fee per day to use the grid. Loading Zones: There are several loading zones located throughout the harbors. They are easily identified by the white paint along the bullrails. Loading zones have a one-hour time limit. There are some 30-minute areas in Crescent Harbor. There is also a loading dock in Crescent Harbor that is used by commercial fishermen to load and unload gear. Some fishermen also use the covered area to mend their nets. Please contact the Harbor Office for usage. This covered area is also used at various times of the year for art shows, food booths and other activities. 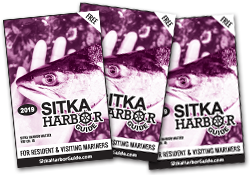 Fish Cleaning: The cleaning of fish in any of Sitka’s harbors is strictly forbidden. Please do not dispose of fish carcasses in the harbor jurisdiction due to Sea Lion issues. Fish cleaning should be done at designated fish cleaning tables. There are fish cleaning tables on the south end of Eliason Harbor breakwater for the cleaning of sport-caught fish. There are also fish cleaning tables on the float outside Sealing Cove Harbor. Fish waste bins are available at both cleaning stations. No commercially caught fish can be cleaned at any fish cleaning table at any of the harbors. Users are requested to clean up the areas after use. Boatsitter Log: Please provide the Harbor office with name and phone number of your boat sitter. It is the responsibility of moorage users to inform the Harbor Department if they are going to be out of town for any period of time and the vessel remains here. Harbor Department staff will attempt to notify the logged boat sitter in the event of an emergency. All berths are assigned by the Harbormaster. Please do not enter a slip without permission of the Harbormaster. Richard I. Eliason Sr. Harbor: off the north end of Katlian Street and extending north. Eliason Harbor is designated as the transient harbor where most transient vessels are temporarily moored. Thomsen Harbor: off the north end of Katlian Street, south of Eliason Harbor. Crescent Harbor: opposite the east end of Lincoln Street, near the Lincoln-Lake intersection. Transient vessels are not allowed in this harbor. ANB Harbor: off Katlian Street, just north of downtown. Sealing Cove: off the west end of O’Connell Bridge, off Airport Road. Personnel: The Sitka Harbormaster is Stan Eliason, Deputy Harbormaster is Jeremiah Johnson, Office Staff is Alicia Patterson, Assistant Harbormasters are Tom Climo, Emy Sumauang and Nick Anderson. Harbor personnel are on duty seven days a week from 7 a.m. to 11:30 p.m. year round. Maintenance Personnel are Ron Pratt and Brian Bellows. Location: The Harbor Department is located adjacent to Thomsen Harbor, at 617 Katlian St.